Earlier this year, Ithaka S+R published results from the US Library Survey 2016, which examines strategy and leadership issues from the perspective of academic library deans and directors. One of the key findings from the study was that library directors are pursuing strategic directions with a decreasing sense of support from their institutions, and a recent study on the perceptions of library value from the perspective of provosts and chief academic officers reinforces these findings. Evidence from across the US Library Survey 2016 indicated that library directors feel increasingly less valued by, involved with, and aligned strategically with their supervisors and other senior academic leadership. Compared with the previous survey cycle in 2013, and across institution types, fewer library directors perceive that they are a part of their institution’s senior academic leadership and that they share the same vision for the library with their direct supervisor. Figure 1: “My direct supervisor and I share the same vision for the library.” Percentage of respondents who strongly agreed with this statement. Figure 2: “I am considered by academic deans and other senior administrators to be a member of my institution’s senior academic leadership.” Percentage of respondents who strongly agreed with this statement. Further, only about 20% of respondents agreed that the budget allocations they receive from their institution demonstrates recognition of the value of the library. 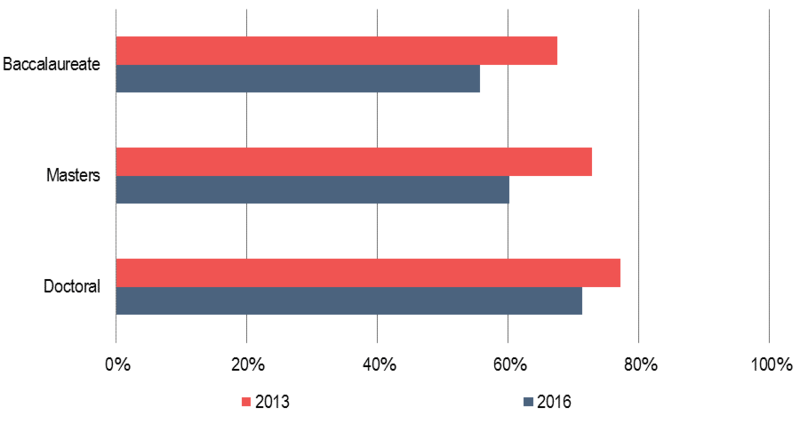 Consistent with the previous survey cycle in 2013, library directors continue to see insufficient financial resources as their biggest constraint on their ability to make desired changes in their library. A recent national study of provosts and chief academic officers, from authors Adam Murray and Ashley Ireland, reinforces many of these findings. Respondents to this survey overwhelmingly indicated that their campus does not recognize the role that the library can play in retention initiatives, and only moderately indicated that they see the library involved in institutional initiatives to support student retention, enrollment, and academic success, faculty research productivity, and accreditation. 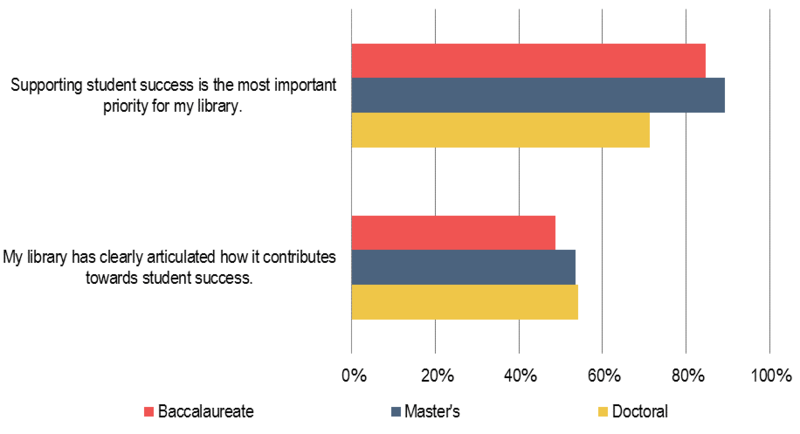 While an overwhelming majority of library leaders in the US Library Survey 2016 indicated that the most important priority for their library is supporting student success, only about half reported that their library has clearly articulated how it contributes. Perhaps it is therefore unsurprising that provosts are unsure of the role that the library can play to support these initiatives. Figure 3: Please use the 10 to 1 scales to indicate how well each statement below describes your point of view. Percentage of respondents who strongly agreed with each statement. Findings from this recent study of provosts’ perceptions offer a number of directions that library directors can pursue to most effectively communicate the value of their organizations to academic leadership. For example, the authors found that demonstrated correlations linking usage of library services and resources with institutional initiatives (including student academic success, retention, and enrollment) were viewed by provosts as most compelling in having influence on funding requests, and many academic librarians have conducted such studies to demonstrate these relationships. It is clear from these studies and previous literature that it is unwise to assume that the academic library will perpetually maintain its place as the “heart of the university,” and that the positioning of the academic library as a contributor to institutional priorities is critical. These studies have me wondering how this can most effectively be accomplished. For institutions that have demonstrated correlations linking usage of library services and resources with institutional initiatives, have these demonstrations led to increases in funding? How compelling are these correlations to academic leaders who often do not recognize this role of the library? Are academic libraries achieving the right balance of demonstrating their value and improving their value? How can academic libraries best champion their organizations while also maintaining objectivity and making evidence-based decisions? To what extent are libraries collaborating with other campus partners to coordinate initiatives to support institutional initiatives? Would a more centralized approach better focus the libraries’ efforts while also highlighting their role? Might academic libraries be better served by focusing additional effort on showing what they haven’t done well and how they are planning to better align their services with institutional initiatives? What are your thoughts? We welcome your perspectives and invite you to comment below. Why does the academic library need to demonstrate value separate and distinct from the university experience rather than integrated and inseparable from it? Why can't we accept the notion that the whole university is a library? Thanks for commenting, Martha. It does appear that the most compelling data on library contributions are those that are integrated and inseparable from institutional initiatives.